Tequila can substitute for several other spirits in cocktails to create a new taste sensation. Use it in place of vodka or gin to see what you get. Also, here are just a few drink ideas culled from the Net (sources listed below). Surf and find others that appeal to your drinking tastes. Again, always use 100% agave tequila. I n the past, agave were harvested when the jimadors decided they were ripe enough. This was generally done when the agaves were from eight to ten years old. Jimadors knew, from generations of experience, when the agave was ripest, when it was rich with sugars and ready for harvesting. Today's producers have to be more diligent and use scientific testing to determine when the agave is at its best sugar content - at least 24% by law (24 Brix), but some prefer to wait for even higher levels, almost 30% (and may be as high as 40 according to some reports). In the past, less scrupulous producers have used agave with as low as 14 Brix, at least according to other producers. The peak sugar period is usually at its highest in the dry season, just before the rainy season. The rainy season fattens the agaves and dilutes the sugars. However, agave are harvested year round, rather than in any particular season. 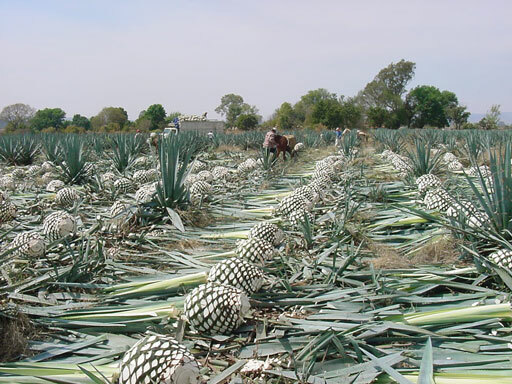 The average sugar content of agaves grown in the highlands is 26-27%, compared to 23-24% around Tequila. The Mexican government decreed in March, 2006, that the average of the sugar content in the agave harvested in a field must be at least 24%. In El Tapatio's fields the average is 27 to 30%. Higher fermentable sugar means more alcohol. 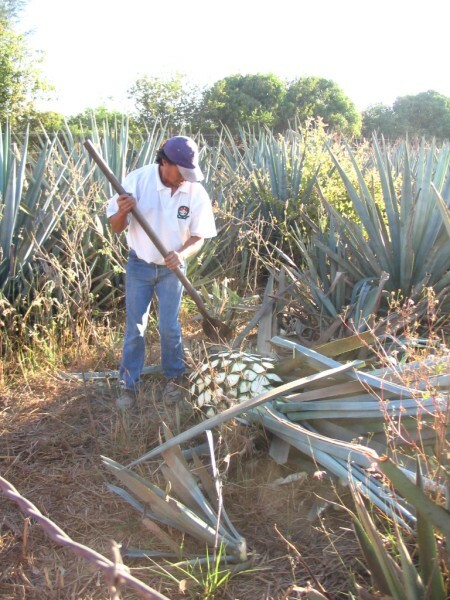 One highland grower claims his 2006 agave crop has an average weight from 60-65 Kilos and the sugar content is consistently 41 Brix units. Generally fields are planted with shoots (hijuelos) all the same age, so the agaves are all roughly the same age. However, like people, agaves grow individually. Some will be larger, some smaller, some will be fat, others thin. The size of the agave is less important than its sugar content. Before they are harvested, agaves are tended for several years by field hands who trim the leaves, cut down any quiotes, and remove the hijuelos for transplanting. The young, tender flower stalk - the quiote or quixotl - is sometimes picked and eaten as a vegetable. 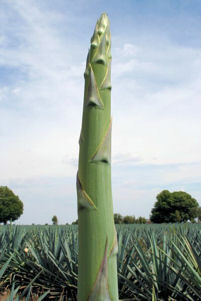 The stalk is not allowed to grow on cultivated agaves, because it uses up the nutrients in the plant to produce its seeds, and is cut so the piña grows fatter. Left to grow in the wild, these piñas would extend a tall shoot, 15 feet high or more, with pale yellow flowers at the top. The wild flowers are pollinated by local long-nosed bats (Leptonycteris nivalis), and then after producing 3,000-5,000 seeds, the plant would naturally die. The dwindling population of these bats is an environmental concern and may spell serious trouble in the future for wild agaves used for fibre, pulque and mezcal. The quiote will also lose moisture once it as flowered and become light and fibrous, similar to balsa wood but tougher. Carpenter bees will nest in the stalk. The quiotes start to appear in years five and six, and grow rapidly. A quiote can grow a meter a week, and if not cut down, after the third week they will start to extend lateral arms which will fill with flowers. Farmers send field hands through the agaves to cut down quiotes every two weeks or less, to be sure they don't grow too large and take away some of the plant's nutrients and sugars. Cutting the quiote encourages the cabeza, or head, to fatten and grow richer with sugars. It also encourages the production of shoots. It will usually be harvested for tequila from six to 12 months after the quiote is cut. 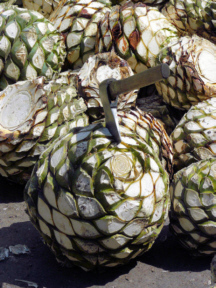 The part of the plant that is used for tequila is the heart or piña (also called the head, or cabeza), which, when its leaves are cut away, looks like a large pineapple or pinecone. It starts underground, but soon pushes its way into the light. A mature piña usually weighs 80 to more than 300 pounds (although most are under 200 pounds). Even 500-lb. piñas have been cultivated in the highlands, although they are rare. The piña is ripe when it starts to shrink and develops a maroon tinge, and red spots appear on the leaves. Another indicator of ripeness is when shoots start to appear on the remnant of the quiote stalk. When ready for harvesting, the carbohydrate-rich piña is cut from its stalk. Then the 200 or more 6-7 foot spiky and thorn-covered leaves (pencas) that stand out from the agave are cut away from the heart by a jimador or harvester (from the Nahuatl word jima, or harvest), using a sharp, long-handled tool called a coa. The skill of harvesting is passed down from father to son and some fields have three generations of jimadors working in them. They are fast and efficient, cutting away the leaves with smooth, even strokes. When the plants are ready, the jimador tips the plant and trims away the leaves, then the rhizomes. Using his razor-sharp coa, he chops the leaves back close to the head, then turns the plant over to chop away the remainder. 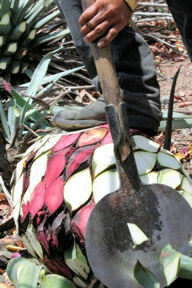 A jimador can trim a large agave in about three to six minutes. Methodical, but fast and efficient, a good jimador can harvest more than a ton of piñas in a day. He loads the heavy piña on a truck. In the past, donkeys were used for transportation, but they are only seen in very small plantations, particularly in Oaxaca today. Until the leaves are cut away, the size of the piña cannot be determined. Two similar agaves may produce dramatically different piñas, so no one can estimate closely how much agave any field will produce just by looking at the uncut plants. 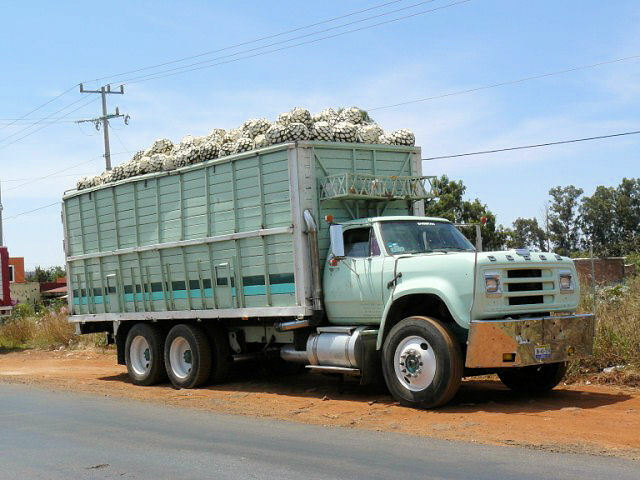 Full truck loads are carried to the factory (fabrica) where the piñas are usually quartered or halved before baking. The remainder of the agave - mostly its leaves - has no other uses in the industry today, although it is sometimes used for compost. 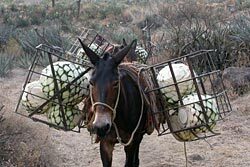 Campesinos may still use donkeys to carry the agave heads down the rows to the trucks. Harvesting is done year-round because the plants mature at different stages in the fields. Some large distillers pick young agaves, but others, like Herradura, use only plants 10 years or older. Most distillers now select their agave by sugar content, rather than looks. As a rule of thumb, the older the agave, the more the head will have accumulated the starches that will convert into fermentable sugars.